While it hasn't always been called Kiernan Farm, the 140-acres of pasture where Marty and Thelma Kiernan raise their cows has been in continuous agricultural production since 1682. The duo was raising racehorses on the land before they decided to convert it to a beef farm about 8 years ago. "The tax laws changed in the mid- 80's and there wasn't much incentive to raise race horses as a business," explains Marty, who also taught physical education at the Pine Bush Central School District for 35 years. Now the Kiernan's raise mostly Angus-Hereford crosses on 100% grass and never use hormones or antibiotics. 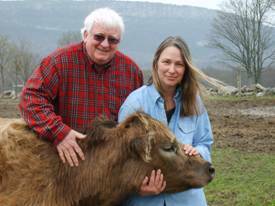 "When we started I was just raising beef for friends," Marty says. But soon he realized that he was on to something. "Thelma was really the driving force behind starting the beef farm," Marty concedes. "She's been around farming for most of her life." While several farmers told the Kiernan's that they would have to finish their animals on grain, with Thelma's insistence, they stuck to their plan. "We were able to convince the naysayers," Marty says. Still he admits raising beef as nature intended isn't cheap. "You have to keep a grass-fed steer about a year longer so it costs me 4 or 5 times what it costs mega farms," he explains. But the quality of his life and the taste of his product far out way the costs. "There's a real sense of satisfaction and accomplishment in what we do." Did you know that Marty's son, a lawyer in Washington D.C., is working to help his family start a vineyard on 5 acres of their farm land! The vineyard and tasting room should be up and going in about 4 years.